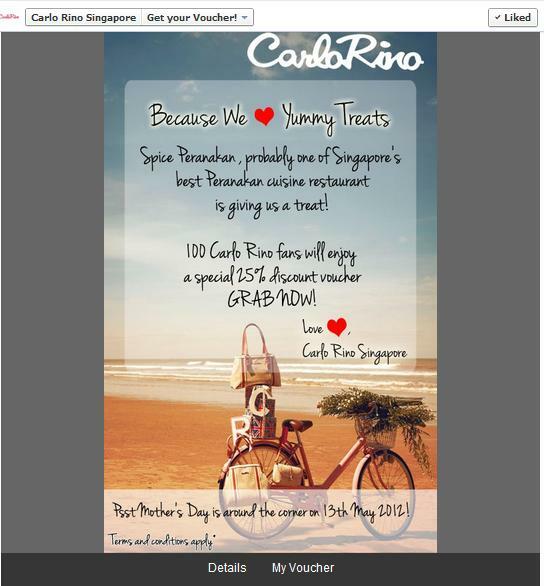 Not too sure why Carlo Rino a handbag brand is giving away food discount vouchers but hey, who cares?! Like Carlo Rino and "click" on Claim Voucher. A voucher with a unique number will be generated. This exclusive deal is only for 100 lucky Facebook Fans of Carlo Rino Singapore. Valid from the 2nd of May to the 31st of May 2012 (11.30am – 3.00pm and 5.30pm – 10.00pm) excluding Sundays and Public Holidays. Bookings should be made via call beforehand. Valid for dine in only.